A new “concessions” law threatening Salvadoran workers and further submitting the national economy to foreign capital is currently being considered by the Salvadoran legislature. The proposed Public-Private Partnership (P3) law creates the legal framework to contract out the operation of state industries, services, and infrastructure to corporations for terms of up to 40 years. The P3 law does not allow for outright privatization of state-owned industries, however, if passed it will mean private firms will be subcontracted for projects that are presently undertaken by the state and public workers. The proposed P3 law was introduced by President Mauricio Funes’ office in early 2012, and is slated to be voted on in April or May by the legislative assembly. Presently, the office of the President continues to endorse the legislation presently before Salvadoran lawmakers. The Party that brought Funes to power through a strategic alliance in 2009, the Farabundo Martí National Liberation Front (FMLN) – led by guerrillas turned politicians in the wake of the 1992 Peace Accords that ended El Salvador’s 12 year civil war – has largely opposed the legislation[i], responding to the demands of the unions and social movements that make up the party base and rank-and-file, who have explicitly rejected this latest attempt at privatization[ii]. The US government and the Salvadoran right wing are pushing hard for the passage of the P3 law. US Ambassador to El Salvador, Maria Carmen Aponte, has threatened to withhold a second round of Millennium Challenge Fund aid worth US$300 million if the P3 law is not passed. The Nationalist Republican Alliance (ARENA) party, El Salvador’s right-wing party founded by notorious death-squad leader Roberto D’Aubisson, has endorsed the law as “key for the generation of employment.”[iii] Salvadoran union workers and international solidarity organizations have been working together to get the word out on the interfering role of the US government in this legislative process, and voicing the civil society’s firm rejection of this proposed law. The P3 is being proposed at a crucial time in Salvadoran political history. Presidential elections are slated for February of 2014, where the Salvadoran right-wing will try to win back the presidency they have always held in El Salvador. The goal is to prevent a former FMLN commander, Salvador Sanchéz Cerén – current Vice President – from repeating the FMLN’s historic 2009 victory. Sanchéz Cerén presents a real obstacle to the continuity of “business as usual” neoliberal practices. An FMLN member during the civil war, Sanchéz Cerén has stated that the proposed privatizations implicit in this law would “further inequalities”, as he endorses the party’s rejection. Given the recent political fracturing of the Salvadoran right, the FMLN is presently well positioned to once again make history, creating a narrow window of opportunity for the Salvadoran right and their US counterparts to get this law passed. The proposed law and the neoliberal interests it represents are being resisted in houses of government by the FMLN, and in the streets by Salvadoran civil society. The latter have experience in successfully defeating privatization efforts as demonstrated by their 2002 victory that prevented the privatization of healthcare in El Salvador. Massive demonstrations, strikes, and creating popular awareness around the dangers of privatization continue to serve as useful tools in resistance struggles against privatization. In addition, international solidarity in resistance to privatization is growing between US and Salvadoran allies, as Americans recognize the importance in lending their voices in support to the Salvadoran struggle. Jaime Rivera, Secretary of the Sindicato de Trabajadores del Sector Eléctrico (STSEL – Union of Electric Sector Workers) has recently returned to El Salvador from a CISPES labour solidarity tour, where he visited cities along the US West Coast to express solidarity with US workers and denounce US intervention. He has been active in Salvadoran labor politics for over 30 years. Jamie sat down with CISPES to speak about the P3 law following a march to the US embassy in El Salvador to denounce Ambassador Aponte’s interference in Salvadoran public affairs. 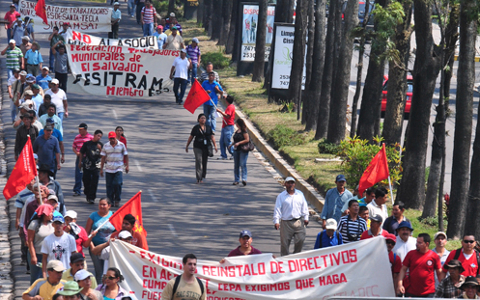 CISPES: What is the Public-Private Partnership (P3) law, and how does it threaten unions in El Salvador? Jaime Rivera: First, it is a proposed law, so it hasn’t yet been signed into legislation. We have to recognize that Salvadoran legislators did not draw up this law; it is actually project of the IMF, the World Bank, and the US State Department. It is an extension of the lie believed by Latin American countries that neoliberal policies would get us out of our crises. This is a second phase of sacking that started in the 90s. You know, the Washington Consensus dictated A, B, C, X, Y in order for our countries to get out ahead. One of these things was the shrinking or reduction of the state, and to make it the least bureaucratic as possible. A lot of public workers lost their jobs as a result of this shrinkage. Another was Structural Adjustment Programs (SAPs), which were also implemented, privatizing the national bank after taking care of its debts. Basic grain production was also privatized, pensions around 1996 were privatized, and many workers with public pensions had their pensions shifted to a private holder. Although we struggled against this, the ARENA government allowed this to happen, and as a result of all of these things, we, as Salvadoran workers, have been shown proof that the benefits to privatization are not all they are made out to be…. Before, the infrastructure built by the state would be sold and the state would receive some, not much really, but some capital back from the sale firms would recuperate their investment in infrastructure in a year and a half and would profit from there on out. Now, people don’t trust this model and so the state uses the new term of P3, of contracts. The airport and the national ports are first on the list, followed by water, remaining energy, health, education, highways, and natural resource (mining) for privatization. This presents a dramatic situation for Salvadorans. On top of the immediate negative impacts of privatization, under this new proposed law if a business venture goes sour, it falls to the state to compensate the firms’ investment. El Salvador is a country with little income, and so this presents a new threat in that Salvadoran taxes could be used to pay debts to transnational corporations, rather than for public programs. CISPES: In the 1980s, unions in El Salvador had to organize in the face of death squads. Today, the challenges are different. How do unions organize and operate today, and what is their strength compared to the time of the military repression? JR: We can’t aspire for the lives of our organizers to be in constant danger as it was in that time when you woke up not knowing if you would go to sleep again. It was a hard time to live. The death squads didn’t respect anything; even being a student was a crime. I was held in a Guardia Nacionál (National Guard) cell for five hours once, just because my ID said I studied at the University of El Salvador (in San Salvador) and I lived in a pueblo (town) outside of the city. It was a horrible repression, I mean; we wouldn’t be talking about these things in those times. So the present period, in wake of the 1992 Peace Accords, is definitely better. What can we take from those years? The struggle. The struggles were great; we came from a history of military dictatorships of high repression, people wanted democratic space where political conflicts could be worked out and so the struggles that took place where people tried to express these political desires were incredible. Also, we had the advantage of a dual front, here in the cities we struggled politically, and in el campo we had the armed struggle. And so, even though there wasn’t a formal unity between the labor movement and the guerillas, there was the feeling that someone had your back. People that risked their lives taking part in unarmed actions in cities knew that there was an armed wing out there that had their backs. Now, threats are different. Before, they would take your life away; now, they take away your job. Fundamental rights, like the right to belong to a union, the right to collectively bargain and organize as workers, the right to strike, were recognized under the Peace Accords. The problem now is that a lot of firms or business owners don’t recognize these rights, and actively repress their exercise. The repression doesn’t come from the state, now it comes from a particular capitalist class that is used to doing this with impunity. Obviously, the repression is distinct, but in order for us to move away fully from the eras of harsh repression that we lived through in times of war, to an era of respect for labor rights will take maybe two, three times the amount of time it has taken us to get this far. Workers have rights to a dignified job, and a dignified pay, the right to organize, strike, and firms need to recognize these rights. Repression doesn’t come from a bullet now, these days it comes from a refusal to recognize our rights as workers. Following the ratification of ILO conventions 87 and 98 which refer to the union rights and the right to collective bargaining, there have been more than 100 unions formed in the public sector and so these have contributed to the growth in union membership in the country. CISPES: The political party of the FMLN holds power in El Salvador today. What is the government’s attitude toward P3, and what is its reasoning? 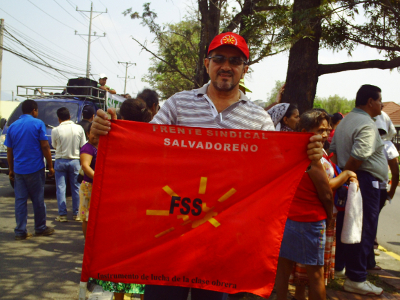 What is the relationship between the FMLN and the Salvadoran labor movement? JR: We have to recognize first that there is a difference between the parts of the FMLN that support the law, that aren’t necessarily reflective of the social movement from whence came the party, but more so reflective of strategic alliances the party has made. The office of the President is one example. When I refer to the FMLN I refer to the part of the party that responds to the social movements active in the country that make up the party’s base. Ideally, this would be all of the party, and there would be cohesion within the party, and between the three levels – executive, party, and social movement – in terms of policy. The FMLN does not support the proposed P3 law, and we don’t see President Funes as a genuine member of the party. The FLMN said ‘No’ to the P3, now there are parts saying that well maybe we could revise it, and the other day an FMLN deputy said ‘they want to privatize education, they want to privatize health, these are things that have to remain with the state’, essentially limiting the law without fundamentally rejecting it. Fortunately, we as social actors, have been able to learn from party members and in our capacity as labor organizers, deeper aspects of the law and recognize that it’s not about limiting the law, rather the issue must go beyond just putting ‘chains’ on this law. There needs to be opposition to the privatization of the CEL, the autonomous executive hydroelectric commission for the Lempa River, there needs to be firm resistance to the privatization of social security, there needs to be firm resistance to privatization – period. The position of our party, because it is from the labor, social, and student movements of the 1980s, and so we as social actors continue to identify the FMLN as ‘our’ party, must be coherent with our demands of no more privatization. In this country, transformations come through politics, but the push for change comes from social movements. Unfortunately, this law would only need 43 votes to pass, and even if the FMLN doesn’t vote for this law it will still pass. It would be very genuine of the FMLN to not vote for the law, and listen to our voices. It’s not just about saving health and education; it’s about having a greater recognition of the dangers of privatization and acting in concert, cohesively, with that recognition. We support Mauricio Funes’ efforts to oppose Enel’s (an Italian energy firm) attempted appropriation of the geothermal generation of LaGeo – the national geothermal energy firm, but we need him to be consistent. Why oppose the privatization of one firm, but welcome the privatization of more? We need coherence on both fronts, from the executive and from the party as a whole. They must recognize that it’s not just about saving education and health, but that there is a much deeper issue at hand. CISPES: What is the political role of the US government in this process? Are there ways in which workers in the United States can show solidarity with the Salvadoran struggle against privatization? Solidarity has always been necessary over history. Solidarity between workers has moved mountains, and is essential to successful movements. Now, with technology, it isn’t necessary that we be neighbors in order to be in solidarity with each other. We can act in solidarity with folks around the world. First, we need solidarity from the working class of the United States, which can come through different forms. CISPES is one organization of working class people that has demonstrated solidarity with the people of El Salvador for more than thirty years. Unions in the United States have much greater membership than here in El Salvador, 11% of the active economic population are organized in unions compared to our 4.5%, and when we convert that into population numbers, we can see that there are some very strong unions in the United States whose voices are surely heard in houses of government. It is important for these voices to denounce the policy of interference their government practices against El Salvador, specifically with respect to this question of the P3 law, so that our country can then manage its own way to find a solution to our own problems. They should also voice our rejection of further privatization, and say to their government that the people of El Salvador totally reject the P3 law. This would be a good first step, to support our rejection of this law and of further privatization efforts. CISPES: What were some of the consequences for Salvadoran workers following the passage of CAFTA (US-Central American Free Trade Agreement? Does the P3 law bring similar threats? JR: The only similarity that really exists between the two is the lies generated to support both projects. CAFTA promised over 250,000 jobs that I’m still waiting for. The markets that CAFTA promised to grow were already growing, the benefit CAFTA gave was to grow it for the benefit of private business owners, but there was no real development of industry or development of economy. Imports continue to outpace our exports at a higher rate than prior to the signing of CAFTA. We resisted this proposed solution, as we knew it wouldn’t be a solution, just like this new P3 law won’t be a solution, just like the Washington Consensus was no solution to our economic problems. The impact of any FTA is negative. In terms of lost jobs, privatization, and higher costs of living. CISPES: Only 11% of all workers in the United States belong to a union, and low-pay, non-union jobs are growing. What similarities did you see between the US and Salvadoran situations on your recent solidarity tour? JR: We have some commonalities between our two movements. We both want to see more union jobs because in reality, the neo-liberal model doesn’t rest, and attacks us all. It attacks Salvadoran workers, and US workers. There are similar repressions against recognition of labor rights, and workers rights, and anti-union sentiments that we see here in El Salvador. While neo-liberal powers have high amounts of capital, in the form of money or objects, we, the working class, have huge amounts of human capital, and we have the capacity to educate people about class-consciousness and bring them into the greater collective struggle. We don’t need to sell our labor for a wage that keeps us enslaved to capital, and keeps us exploited when we can rise up collectively. I insist, US workers, you too are being threatened by the same neo-liberal model that threatens us. Not just the US, Europe has gone through major changes at the expense of its workers. It has injected huge amounts of capital into private banks and billed it as a way of getting economies back on track and people back to work. But on the contrary, workers wages have been frozen, pensions have been frozen, and so they may have saved the Euro, but they threw out their population. And so, maybe through these economic crises there is a resurgence of the social struggle, and the union struggle. We believe that the emptier our bellies get, the stronger our struggles get, and the more pressure we put onto the capitalist class to have our rights as workers recognized. We must remind them that it is not they who create wealth, but rather us workers who produce it. We keep seeing this trend of there being more of us who are poor, and fewer of us who are rich, but the greater number of us who are poor get poorer while the fewer number of those who are rich get even richer. This is capitalism’s great failure, where the market cannot consume what it produces. There is a need for a rethinking of capitalism at least, I mean, we believe that it should be done away with because we see that it has failed spectacularly through these cyclical failures. We think it’s necessary for us to think of a new system, where the state is a benefactor, rather than a vehicle for exploitation, where human beings are the central focus of the state and not just in rhetoric but in action, then, maybe we’ll start talking about real benefits to our society as a whole. The workers of the world must unite! It’s the only way! An edited version of this interview will be published in the May/June issue of Against the Current. Jaime Rivera is a union member, and labor activist in El Salvador. He recently toured the West Coast of the United States on a labor solidarity tour with CISPES, the Committee in Solidarity with the People of El Salvador. CISPES invites YOU to join us on our upcoming labour delegations to El Salvador. Come and express solidarity with Salvadoran workers, and learn about the Salvadoran struggle from April 27-May 4, 2013. ¡La lucha sigue! The struggle contines! Alex Garcia is a member of the Committee in Solidarity with the People of El Salvador (CISPES).